A previous article entitled Battlefield: Black Sea examined the development of US and NATO military deployment in the Black Sea region. This article focuses on the ways in which Russia is moving to counter what it perceives as an aggressive US-NATO strategy. After the US-backed coup in Ukraine, the people of Crimea voted for reunification with Russia. While this was undoubtedly a politically and economically motivated move to secure their own safety and future amid the entirely predictable collapse of Ukraine, it would not have been possible without a clear military and strategic (and of course political and diplomatic) benefit for Russia. That such a benefit existed was plainly obvious. For Moscow, Crimea is more than a historic territory of Russia; it is a strategically vital region for Russia’s navy and military generally. The security and integrity of the Russian Black Sea fleet, based in Sevastopol on the Crimean peninsula for more than two centuries, was of primary importance to Moscow. As such, since the accession of Crimea to the Russian Federation, and the chaos throughout Ukraine, the Kremlin has moved quickly to modernize and bolster its naval assets in the Black Sea. While this was necessary by any measure, the move was also to preempt any military escalation by US-NATO; Washington and Brussels have moved ahead with their military buildup regardless. Within months of the Crimea referendum, Russia announced a massive upgrade of the Black Sea fleet, in order to make it, in the words of Russian military officials, “modern” and “self-sufficient.” As Commander-in-Chief of the Russian Navy Admiral Viktor Chirkov explained, “The Black Sea Fleet must have a full complement of naval vessels to be capable of performing all assigned missions…This is not a provocative military buildup. This is something the Black Sea Fleet urgently needs as it has not been receiving new vessels for many years.” As part of this modernization and upgrade, the fleet will receive 30 new ships by the end of the decade, including a full complement of modern warships, submarines, and auxiliary vessels. 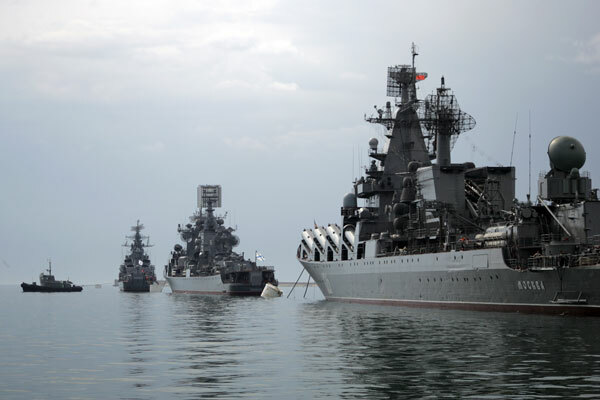 Additionally, Moscow intends for the fleet to be self-sufficient, meaning that it will expand bases, house troops year-round, and generally be able to support itself in Crimea without the need for special assistance from Moscow. But Russia of course recognizes that the growing political conflict with the West, with all the attendant military and strategic implications, requires partners and allies. With that in mind, Moscow has worked diligently to foster military cooperation with China generally, and in the Black Sea specifically. Earlier this year, Russian President Putin and Chinese President Xi Jinping agreed on a preliminary military deal worth upwards of $3.5 billion. According to Chinese media reports, the agreement would see Russia providing fighter jets, submarines, and other advanced military technology and hardware. This would mark a major turning point in military cooperation between the two countries which has had a rocky recent history. Of course, it is a mutually beneficial cooperation as Russia gains a valuable political and military partner in its conflict with the West, while China gains access to critical military hardware in its escalating conflict with Japan and in the South China Sea. We have vast potential of cooperation in the defense sphere, and the Russian side is ready to develop it is a wide range of areas… amid a highly volatile world situation, it becomes particularly important to strengthen reliable good-neighbourly relations between our countries…This is not only an important factor for security of states but also a contribution to peace and stability on the Eurasian continent and beyond… regular private meetings between the leaders of Russia and China give a powerful impetus to development of bilateral partnership. It is clear that both Russia and China understand the potential and necessity of close military interactions between the two countries. And right now, with US-NATO expanding its presence in the Black Sea, Moscow and Beijing have decided to flex their muscles. While US military forces deploy in Romania, Chinese warships have made an unprecedented move, entering the Black Sea to participate in the Joint Sea 2015 naval exercises with their Russian counterparts. Beijing’s Defense Ministry noted that, “The purpose of the exercise is to strengthen the friendly exchanges between the two sides … and to improve the capability of the two navies to deal with maritime threats,” adding that “this joint exercise is not targeting any third party and is not related to regional security.” While the diplomatic language is meant to soothe relations with Washington, the regional dimension of these exercises is certainly not lost on US military and strategic planners. But while joint military training and exercises may indicate a growing partnership, they alone do not constitute a military alliance. Indeed, Russia and China have yet to formally declare any such overt alliance, though one could be forgiven for presuming a de facto one. However, the transfer of advanced – and militarily sensitive – defense technology is a concrete indicator of an inchoate alliance between the two powers. This deal is militarily significant because of the transfer of advanced missile defense technologies that can provide Beijing with a measure of security from a host of threats, including those stemming from China’s ongoing conflict with Japan over disputed islands, as well as from the US and its aggressive “Asia Pivot” strategy in the South China Sea, and throughout the Asia-Pacific region. However, the agreement between Russia and China is also critical for symbolic reasons. That Moscow decided to provide these advanced systems to China before any other country, and that they would do so at such a critical moment for both countries, indicates that while a formal alliance has yet to be announced, we are witnessing one emerging in all but name. In an unprecedented move unthinkable just a few years ago, Chinese troops marched through Red Square during the ceremonies commemorating the 70th anniversary of the Soviet and allied victory over fascism, further proving the symbolic connection between the two countries. The international security dimension is also critical to understanding the importance of the recent deals. The S-400, which is considered capable of matching up against any aggressive missile system employed by the US and NATO, symbolizes a growing, though not yet achieved, military parity between the US-NATO and the Shanghai Cooperation Organization. Although Washington still postures as if it maintains full spectrum dominance globally, the reality, painful though it may be for many strategic and military planners in the West, is that US-NATO simply does not control Asia or Eastern Europe. Looking at a map, it becomes clear that the total space militarily under the thumb of the US is shrinking, while Russia, China, and their allies are increasingly becoming militarily independent and capable of defense. This sea change in the global chessboard will have implications for decades to come. It is crystal clear that the burgeoning alliance between Russia and China will have implications throughout the world, from the South China Sea to the Atlantic, changing the strategic calculus throughout all of Eurasia; essentially much of the globe. But while direct alliance is still not yet fully realized, its broad contours can be seen in the Black Sea, today one of the hot spots of the East-West conflict. The US-NATO presence in the Black Sea and the littoral countries is a clear indicator of the importance Washington and Brussels attach to this area along the southern border of Russia. Conversely, Russia has made countermoves to both show strength and to increase its military readiness in the face of the West’s provocative moves in Russia’s traditional sphere of influence. While the chances of a military conflict remain low, even the potential raises terrifying possibilities. A nuclear power like Russia that, despite its military might and technical expertise, is still far behind the US with its robust military-industrial complex which never had to go through the dismantling that Russia’s did in the wake of the collapse of the Soviet Union. As such, Russia would be heavily reliant on nuclear deterrence, thereby creating the potential for an apocalyptic confrontation. Such a doomsday scenario, though unlikely, should give everyone pause. In the interest of peace, the US and its allies, were they interested in stability rather than expanding their own hegemony, would do well to respect Russia’s sphere of influence and do everything to defuse the situation. However, for the West, war is good for business. And with the growing tensions with Russia, especially in the Black Sea, business is most certainly booming.